This is not a book that you pick up if you just want to laugh or find yourself entwined in a intriguing and adventurous plot. But the moment you finish the first paragraph you will wish you had prepared a full afternoon just to devour these true stories of heartbreak, disaster, death, family, friends, depression, and rebirth. You will laugh, and if you don’t cry I’d be surprised. 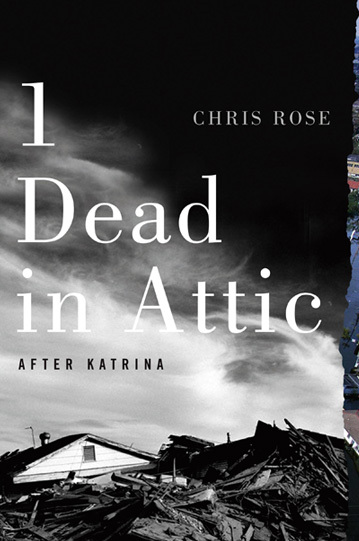 Chris Rose writes about packing his family and leaving when Katrina became an urgent threat, and he returned to the Big Easy just ten days after the storm. This collection of stories takes the reader through his experiences, not just from his observations of the physical destruction caused by the Thing, but of the emotional journey as well. No doubt you watched the news and saw people being airlifted from rooftops, you formulated your opinions about the people who chose to stay despite the evacuation, and you may have even found a way to help with relief efforts (even if it was only to put a few coins into a collection jar at your local grocery store). The point is, you knew about Katrina and the failure of the levees, but you don’t really know what it was like unless you were here, and this memoir is probably the closest you can get to understanding what it was like to be here during the aftermath. Rose’s writing is like reading a journal; you read the rawness of his observations, his emotions, and you feel like you’re peeking into something secret, something that you’re not really supposed to see. Yet you keep turning the pages climbing deeper and deeper into a reality that is a very significant part of another person’s life. The paragraphs are short, sometimes only a sentence long, as are the chapters. And while this structure is a little choppy (similar to reading newspaper articles), the thoughts flow, they meld, and they dance around each other with humble ease. If you want to know more about New Orleans, her people, and their dedication to each other then this is a must read book. Nothing brings people together like a tragedy.